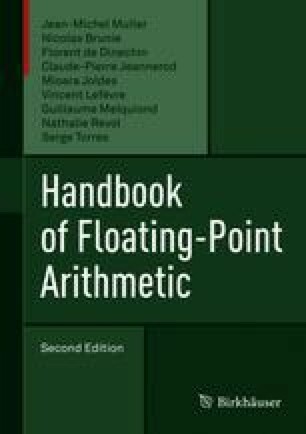 The previous chapters have given an overview of interesting properties and algorithms that can be built on an IEEE 754-compliant floating-point arithmetic. In this chapter, we discuss the practical issues encountered when trying to implement such algorithms in actual computers using actual programming languages. In particular, we discuss the relationship between standard compliance, portability, accuracy, and performance. This chapter is useful to programmers wishing to obtain a standard-compliant behavior from their programs, but it is also useful for understanding how performance may be improved by relaxing standard compliance and also what traps one may fall into. B. Amedro, V. Bodnartchouck, D. Caromel, C. Delbé, F. Huet, and G. L. Taboada. Current state of Java for HP. Preprint, Technical Report 0353, INRIA, 2008. Available at http://hal.inria.fr/inria-00312039/en. ARM. ARM Developer Suite: Compilers and Libraries Guide. ARM Limited, November 2001. Available at http://infocenter.arm.com/help/index.jsp?topic=/com.arm.doc.dui0067d/index.html or in PDF at http://infocenter.arm.com/help/topic/com.arm.doc.dui0067d/DUI0067.pdf. ARM. ARM Developer Suite: Developer Guide. ARM Limited, 1.2 edition, November 2001. Available at http://infocenter.arm.com/help/index.jsp?topic=/com.arm.doc.dui0056d/index.html or in PDF at http://infocenter.arm.com/help/topic/com.arm.doc.dui0056d/DUI0056.pdf. ARM. ARM Compiler: armasm User Guide. ARM Limited, 6.7 edition, 2017. Available at http://infocenter.arm.com/help/topic/com.arm.doc.100069_0607_00_en/ or in PDF at http://infocenter.arm.com/help/topic/com.arm.doc.100069_0607_00_en/armasm_user_guide_100069_0607_00_en.pdf. Rationale for International Standard—Programming Languages—C, 2003. Revision 5.10. Available at http://www.open-std.org/jtc1/sc22/wg14/www/C99RationaleV5.10.pdf. W. Kahan and J. Darcy. How Java’s floating-point hurts everyone everywhere. Available at http://www.cs.berkeley.edu/~wkahan/JAVAhurt.pdf, 1998. D. Monniaux. The pitfalls of verifying floating-point computations. ACM TOPLAS, 30(3):1–41, 2008. A preliminary version is available at http://hal.archives-ouvertes.fr/hal-00128124. Sun. Numerical Computation Guide – Sun TM Studio 11, 2005. Available at http://docs.sun.com/source/819-3693/.